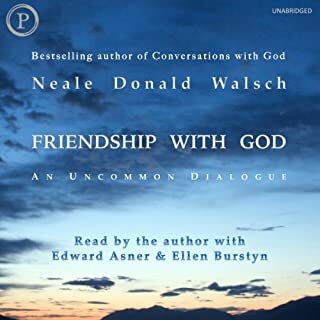 Loved Book 1, really believed that Mr. Walsch had that "conversation" with God, because many of his points and explanations for things unseen made perfect sense as "God" explained them. However, Book 2 is a little hard to swallow. God recommends a particular private school as the best one for our kids? God quotes government statistics to argue His points? 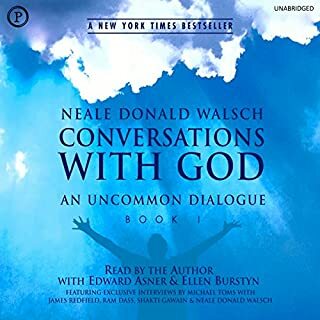 Trust me, I really want to believe that a conversation with God is possible, but I found myself rolling my eyes and shaking my head far too much while listening to Book 2. There is a Book 3 but I am reluctant to buy it after listening to Book 2. Book 2 took away much of the hope and enlightenment I felt after listening to Book 1 and replaced it with more of the same old skepticism and doubt. Would you listen to Conversations with God Book 2 again? Why? Yes, because it is a book that has so much information. Must put it down, give it sometime and than come back to it when you have experienced yourself then you will be able to acknowledge other ideas & theories. 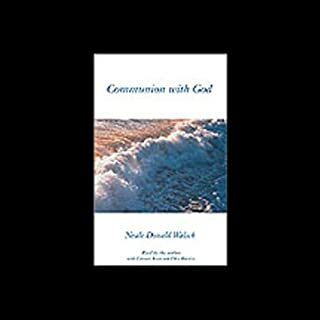 What other book might you compare Conversations with God Book 2 to and why? First of its kind that I have read. What does Ellen Burstyn and Ed Asner bring to the story that you wouldn’t experience if you just read the book? The emotional character that the author would had perceived, although at times I would imagine god to be less frustrated or even angry sometimes, which does a bit go against the fact that God sees nothing as right nor wrong. What is right? What is wrong? Think Again! this book has made it so much easiler for me to read books, especially during transit and have enabled me to finish Book 1 and Book 2 already. As a slow reader, listener as well as I had to go back and listen again and again some parts. The additional interviews were really great and at better interviews than in book 1. My least favorite of the three but I still good! For instance, in this book "God" states that Hitler is in heaven. At first I had a very hard time swallowing this. I about pulled over on the side of the road ( I usually listen while driving because I travel much for my job) because I was kind of irritated at first for the thought of saying that. I felt very mad that someone would even suggest someone like Hitler would be in heaven. I had to pull myself away from my preconcieved notions and start the chapter over again because I felt I was being close minded which was not what I wanted to do with the book. It definitely continues to build on the thoughts and ideas of book one. These books are very thought provoking and insightful. I really thought that these books are wonderful reads but this one is the slowest of all of them. If Neale reads this, maybe he can find out why our forgetfulness is key? This was mentioned but not expanded upon as promised. I would sure like to be able to retain all skills and knowledge that we have learned but forgotten not only in this life but previous ones. It sure seems a shame to waste 20-30 years of every life to learn new skills and relearn old ones. It was consistently stated that our forgetfulness is key to the plan, and that we aren't here to learn, yet with our often failing memories we must learn and relearn. It was said that we are here to remember, and that we know all, future, past events and knowledge of everything. Maybe this is what is gained through meditation, but it doesn't allow one to necessarily practice medicine. It would be great to say I know all about any subject and it be true and socially accepted. It would have been more credible had Neale not mentioned "The Course in Miracles", as the subject matter is very similar. We are constantly evolving spiritually and mentally as a human race: This series seems similar to the difference theologically speaking between democracy and tribal headhunters. Looking back with 20 /20 vision we may say later, how did we ever have such a narrow mind on theology to assume that God is limited to our mental constructs. 400 years ago we thought we could fall off the edge of the earth. I'm in favor of widened beliefs. One thing has me puzzled. If we exist in all moments seperately, how does our consciousness seem so serially connected? What is the miniscule moment of time or awareness that each seperate one of us endures? When time seems to stand still, maybe it's because this moment is experienced by many of our imagined identities and held in awe by each. This 2nd book in the CWG series is, well, phenomenal. These books are transformative and I keep listening to them over and over. The ideas here could truly change the world, 1 person at a time. I highly recommend this book (and the other 2 in the series). Thanks for making the best book, never heard better narrators. I’ve bout lots of audiobooks, the content and the narrators are marvelous!!! Thanks Neal, Ed, Ellen, and god! 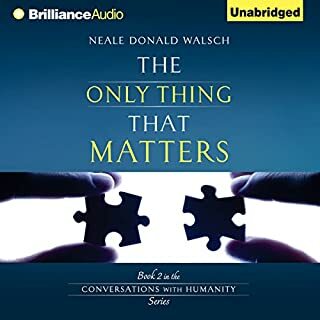 I had already read this particular book, but I wanted to purchase the audiobook this time. This book is one of the most insightful books I have ever READ IN MY ENTIRE LIFE!!!!!! Ilegal me start by saying that CwG 1 was as life changing and transformational as “awakening to my soul”. Book two carries this same energy but it awakens us to our collective soul and how to go about living with this knowledge and responsibility. I absolutely loved it and would recommend it to everyone!!!! Incredible, and what I needed to hear. thanks Neale Donald. this book is amazing and audible even made it better. this is my 3rd time listening. I'll continue replay it. thank you. The sense, integrity and truth emanates from every page. Book 3, as with the other two books, is a book that speaks, promotes and endorses unconditional love in a world full of human made conditions. For many years I was a child of a lesser god, but after reading the conversations trilogy, I have been able to dispel the outdated prejudices, bigotry and hatred (the fears) of ancient rhetoric from my life. I find it hard to express how much happier, content and fulfilled I feel since I have adopted the teaching from these books. They have answered all my questions about life and the universe and our relationship to everything including our purpose for existing. My vision about everything has changed dramatically for the better. I found myself through the 3 books, after listening to the trilogy I then play random chapters at completely random. As a dj I listen to a lot of music so the tones of the readers is a big thing for me, the book is beautifully presented with both a male and female speaking the words of God, this has been amazing as I was able to picture a mother and father figure speaking to me, and conversing with me. 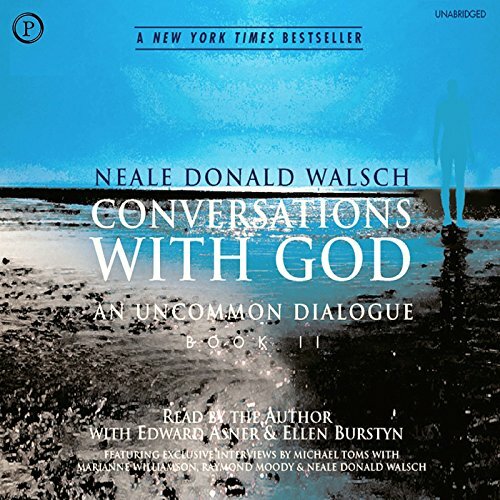 This has been very helpful in helping me better communicate with my mum who is a devout Muslim, I have been able to converse with her about God and not religion. I short these books have changed my life and I am forever gteaful. Heart warming book. Here and now be who you are. I truly love it. It seems like I heard it before but I have forgotten it what life is. Take your time with it, it's captivating but take a break from it every half hour and just soak in what you've heard to get the most out of it. if you want a critically thinking state that stimulates your need for more holistically, download this now! 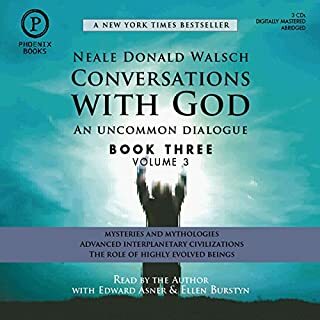 This my second time listening to this book I also listen to the other series by the author, well put together with clear understanding. loved this book. dramatic reading for the voice of god is not so desireable although in saying that I realised I had supressed emotion about that. so use this book and reflect on all your reactions, feelings and emotions that arise during the programme. Please study/check your Bible to confirm what you hear! This audiobook can be misleading! The Bible clearly talked about Hell and even lake of fire but this author suggested otherwise. Jesus Himself spoke about evil but again this author said God told him there's no such thing as evil. well I strongly recommend you study and cross check with the Bible to confirm what this author wrote in this book. He also said that we're equal with God! The last person who had such thoughts was Pharaoh of Egypt. Please read what happened(in the Bible) to him and Egypt since then. We are made in His image doesn't make us equal with Him!